After living in Chiang Mai for over 2 months, we prepared a list of ideas on how to have fun in the city, whether you’re visiting for a few days or traveling long-term like us. This is one of the most popular things for people to do when visiting Chiang Mai: spending time with the elephants! When looking to visit a rescue center, it's really important to find one where the elephants are being taken care of and are not been abused of in any way. The Elephant Nature Park in Chiang Mai cares about their animals; you'll see it as soon as you get to the park. The entrance fee for an entire day at the Elephant Nature Park starts at 2,500 baht, but you also can stay overnight at the park or even spend a few days volunteering. Make sure you reserve your spot on their webpage in advance, as they tend to sell out, and even more so during high season (November – March). We'll be posting a whole article about our visit to the Elephant Nature Park soon, so stay tuned! Wat Phra That Doi Suthep (commonly known as “Doi Suthep”) is the most known temple in Chiang Mai. It is located on the Doi Suthep Mountain, with an elevation of 1,676 meters. While there is an electric tram that you can catch to get to the top, I recommend walking the 300+ steps to properly explore the complex in all its authenticity. Once at the top, you pay the entrance fee to get into the complex, which is 40 baht for foreigners. From there, you’re able to explore the temple, the surrounding area, and gaze out at the amazing viewpoints of Chiang Mai that Doi Suthep offers. You can use public transportation to get here. I suggest trying to find a songthaew (aka red car) in Chiang Mai that takes you to the top of the Mountain. In the case that you’re unable to find any going in that direction or going that far, do what we did: take a songthaew or Grab to the Chiang Mai Zoo, which is located at the bottom of the Doi Suthep Mountain. The ride shouldn't cost more than 40 baht per person, and to return you can either arrange a songthaew or take the first available one back. At 2,565 meters high, Doi Inthanon is the highest peak in Thailand. On your way up the mountain, you can make stops along the way to visit waterfalls, nature treks, viewpoints, a museum, traditional markets, and lastly, enjoy the most beautiful stop at the peak: The Royal Twin Pagodas. We especially enjoyed the Ang Ka Nature trail, an easy 20-30 minute walk through the mountain and all of its nature. 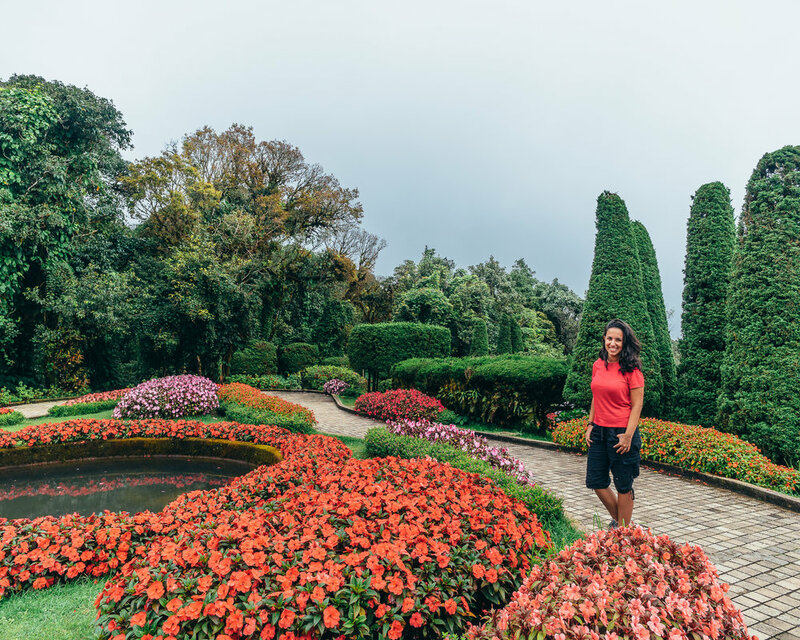 Doi Inthanon is located about an hour-and-a-half to two hours from Chiang Mai, but the trip is completely worth it! The entrance to the park is 300 baht per person, and an additional 40 baht to visit the pagodas. Our photos don't do the place justice because the weather wasn't playing in our favor, but it really is extremely beautiful. Tip: As always, try to go early to avoid the crowds of tourists so that you can get great photos! On our way back from Doi Inthanon, we stopped to explore the Wachirathan Waterfall. Vehicle parking is located a few steps from the actual waterfall, making it really easy to get to. Even though it’s close to the street, the waterfall is stunning and the nature around it is really well taken care of. There's no entrance fee, and there’s even a little coffee shop next to the waterfall that makes for a perfect place to take a short break and enjoy the views. If you'd like to visit more waterfalls in the area, you can also check out Mae Ya Waterfall (the largest one in the area), Mae Pan Waterfall, and Mae Klang Waterfall, among others. Food markets in Chiang Mai, as in the rest of Thailand, are the best place to find the most delicious and inexpensive food items. Chiang Mai has quite a few fantastic night markets that are great to eat at, but also great for purchasing souvenirs and traditional Thai products. If you want to see what kind of night markets Chiang Mai has to offer, check out the 8 night markets we liked best and add some of them to your list of things to do in Chiang Mai! This hilarious show is located at the Anusarn Market. It starts at 9:30 pm everyday and lasts about an hour and a half, during which you'll enjoy various performances from professional transvestites (actors/actresses), including dancing, singing, and just a touch of comedy that will surely make for a memorable night! We recommend going a little bit before 9:30 pm to get a good spot. The entrance fee is 350 baht and includes a drink. For one of the most amazing real-life 3D experiences, you have to visit Art in Paradise in Chiang Mai. Their immersive murals are expertly combined with outside props, giving each of their exhibitions a three-dimensional feel in-camera — you’ll look like you’ve been transported to another world! They also have an augmented reality app that you can download with their free in-house wifi that allows you to take “living" videos and pictures of the exhibitions: certain parts of the art comes to life and begins to move about within your phone. For example, if the 3D mural is an underwater mermaid shoot, the surrounding fish and bubbles suddenly begin to move about. The entrance fee for Art in Paradise is 400 baht per person. Spending two days at Mountain Float has been one of the highlights of our time in Thailand. This beautiful complex is located about an hour-and-a-half north of Chiang Mai, and is the perfect place to relax and disconnect from the "stress" of city life. Time will fly by when you’re here, and in a good way: Aside from the delicious arrays of food they’ve got to offer, the numerous water games they have in store for you (kayaking, boat pedaling, trampolining over water, etc.) will make this some of the most relaxing and entertaining days of your vacation. Getting there: We used a white Songthaew from Warorot market that only cost us 20 baht, and it got us fairly close to Sri Lanna National Park. Afterwards, you can take a tuk-tuk to get to the park, and from there the Mountain Float team will take you to the floating cabins via speed boat. This is the cheap and long way. However, if you want something quick and easy, you can just arrange a taxi both ways. The entrance fee to Sri Lanna National Park (where these floating houses are located) is 100 baht per adult and 50 baht per child. Thai cuisine is one of the most famous cuisines in Southeast Asia; learning how to make your favorite Thai dishes and what ingredients are used is an experience that nobody should pass up! (Even if you're not into cooking like us.) We had an amazing time at Thai Secret Cooking School, where they took us to a local market and introduced us to various customary ingredients and spices, brought us back to their site to pick fresh ingredients from their own personal garden, and instructed us through cooking 5 delicious courses (including dessert! ), which we then promptly ate. 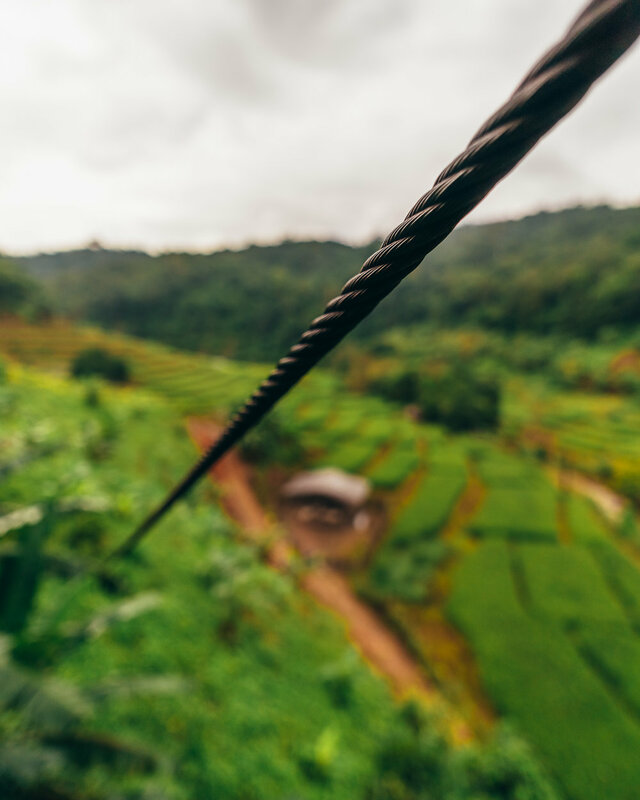 Ziplining is your best bet if you want to release some adrenaline while contemplating beautiful landscapes — something I highly recommend! Eagle Track offers an amazing and thoroughly safe experience, with different packages that will have you flying through beautiful rice fields, walking and traversing through several obstacles, and even jumping from a 40 ft. tree (for those of you who, like me, are terrified of even the thought of this, don’t worry — you can go down slowly!). They have ziplining packages starting at 1,400 baht if you book at least 30 days in advance, with both lunch and transportation included. This is a really fun adventure we highly recommend! Tip: don’t forget to apply your mosquito repellent! 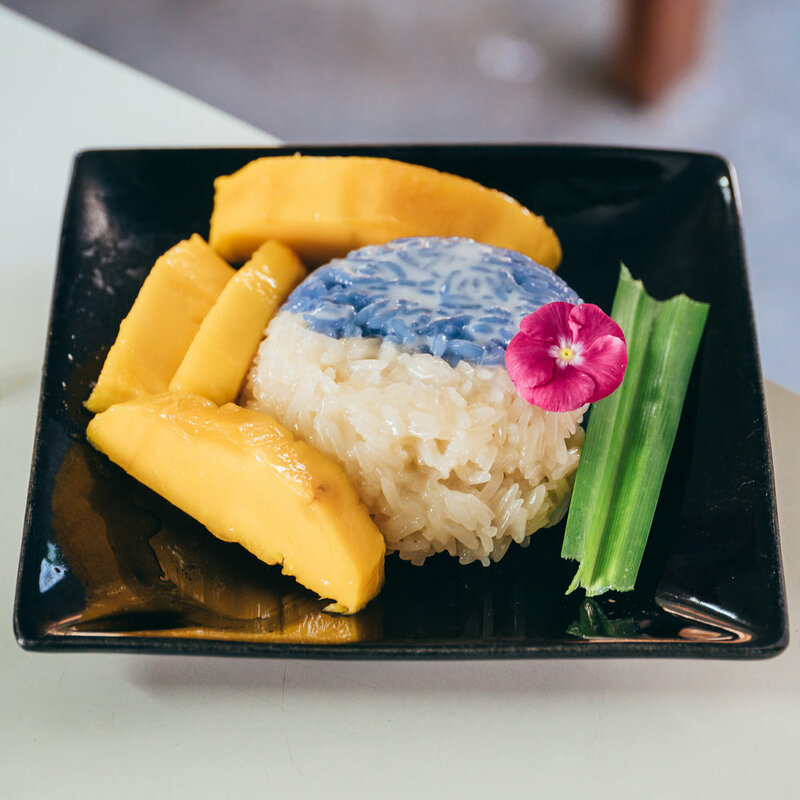 If you have been following our journey at all since we started, you already know that mango sticky rice is one of our weaknesses in Thailand. This sweet mix of sticky rice, mango, and coconut milk is one of the favorite Thai desserts, and rightly so! Although it may seem like a strange mix of foods, don't hesitate to give it a try — we're sure you won't regret it! 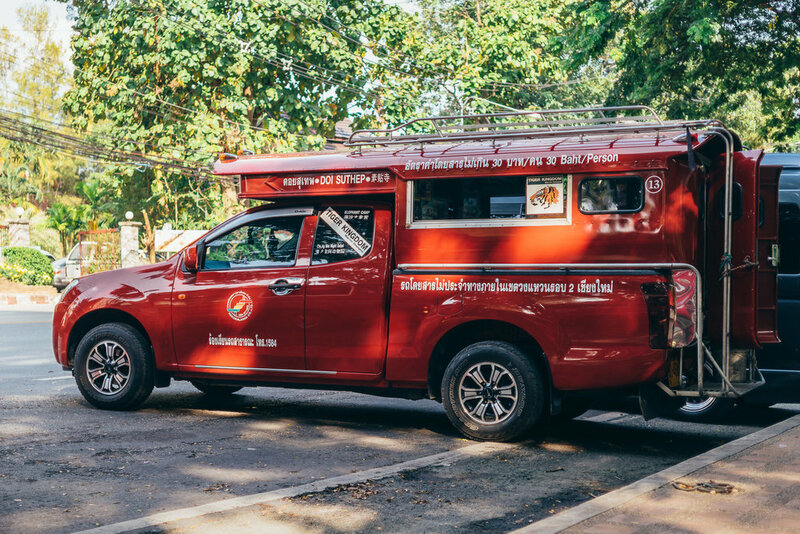 If you want to experience Chiang Mai like a local, use the “songthaews,” or “red cars," to move around the city. These vehicles are enclosed pickup-trucks with always-open back doors that allow travelers to hop on and off at any part of the city for about 30 baht per person. All you have to do is stop one (they’re usually stopping for you because they want the business) and tell them where you want to go. If you're not familiar with the area you’re traveling through, keep your map application open so that you know when push the button inside that’ll let the driver know to stop. A good traditional Thai massage is something you shouldn’t miss when visiting Thailand. Chiang Mai has hundreds of options to choose from for massages, from luxury spas to shops setup at night markets. You can find massages from as little as 80 baht ($2.50) at the night markets. I've always been against violent sports, especially any kind of sport that specifically involves fighting. After a couple of weeks in Chiang Mai, we made a couple friends who were training in the Muay Thai style of fighting, so I decided to put aside my prejudices and give it a shot, exploring a little more of what this sport is about and its relevance within Thai culture. After attending the event and watching the fights, I’m still of the same belief in regards to violent sports, but I’m definitely glad I opened up to trying something new that ultimately helped me understand Thai culture better. If you’re looking to be a spectator at one of these Muay Thai fights, you can usually find a fight every night of the week. We went to Thapae Stadium, where the the entrance fee is 400 baht. If you want to have an intense workout and see what Muay Thai is all about, there’s no better place to do it than Thailand! On just one visit, you’ll learn the basic techniques behind Muay Thai, including kicks, knees, elbows, and punches. Plus, I have to admit, it really felt good to release all of that energy and adrenaline and ultimately not have to hit anyone (directly). The price varies depending on the gym that you train at and how many sessions you buy. One of Chiang Mai’s historical landmarks is Tha Phae Gate, dating back to the 13th century. Tha Phae Gate is part of the fortress that surrounds the old city, and is a key point for different events throughout city. You can explore the whole wall, which has a square form and goes along a narrow river that divides the “Old City” from the rest of the area outside. And during the night, several lights surrounding the wall bring it to life, giving the entire city a really cool vibe! Visiting the temples is one of the magical things to do while exploring any city in Thailand. Chiang Mai is home to some amazing temples and you should definitely add one (or all) of these to your list when you visit! This sculpture is one of the icons of Chiang Mai and represents the three founders of the city. It's located in a plaza in the center of the old city and is directly in front of the Chiang Mai City Arts & Cultural Center, which you could visit afterwards. In many of the temples in Chiang Mai, you’re able sit down with a Buddhist monk and chat with them about their culture and traditions for free. This is such a cool and enlightening experience! They get to practice their english and you’ll be able to ask them anything you may be curious about, even including some controversial questions about Buddhism! Check the times before visiting, since these can change at any moment. 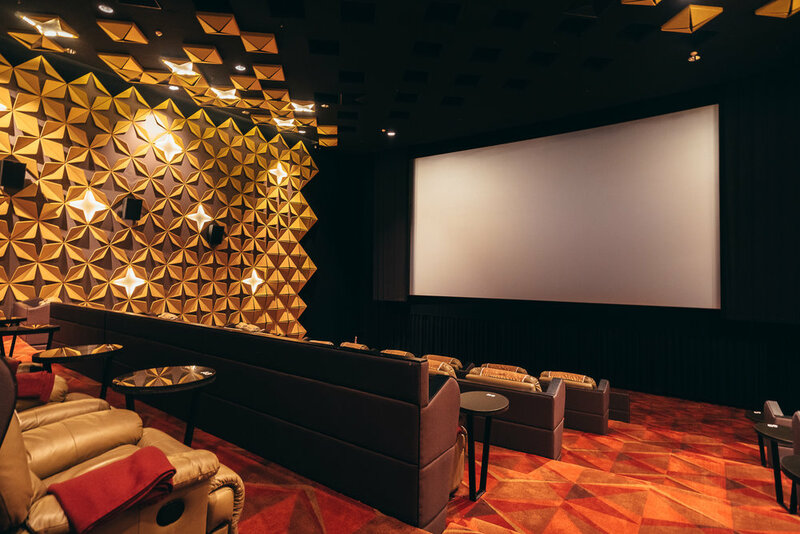 We wouldn’t recommend this if you’re only spending a couple of days in Chiang Mai, but if you’re in town for a little longer and enjoy a cinematic experience as much as the next person, we really recommend trying the "VIP experience" at the SFX Cinema in Maya Mall. For only 400 baht ($12), you get your ticket to the movie that you’ll be watching from the comfort of a luxurious reclinable sofa — with UNLIMITED popcorn and soda included. (Yes, caramel popcorn too.) It’s a really cool experience to treat yourself to! 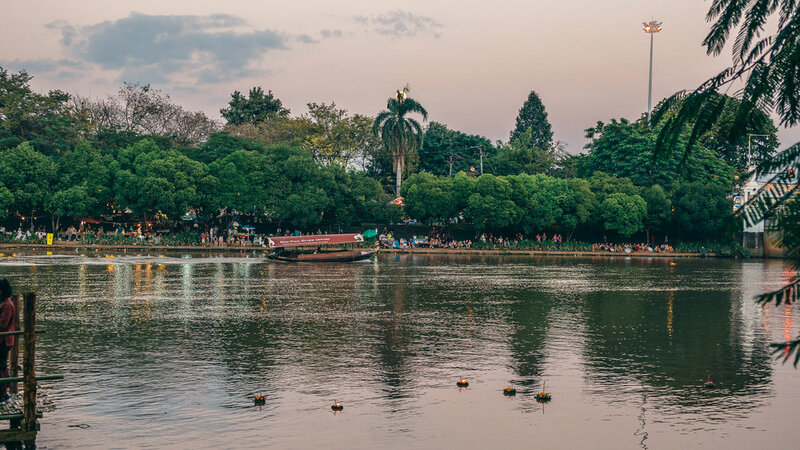 Ping River is situated east of the Old City of Chiang Mai, but you can easily reach it on foot by crossing the Nawarat Bridge where it intesects with Tha Phae Gate. From here you can choose different ways to enjoy the views (especially at sunset, as seen down below! ): through day cruises along the Ping River, riverside walks, or a lunch or dinner next to the river. 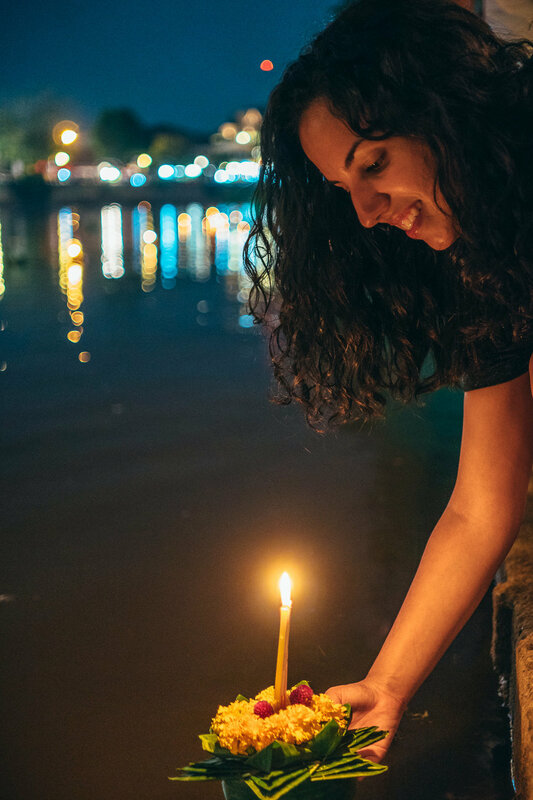 Loi Krathong and Yee Peng are the two of the most famous festivals celebrated in Thailand annually, consisting of lanterns being released into the sky and candles onto Ping River. 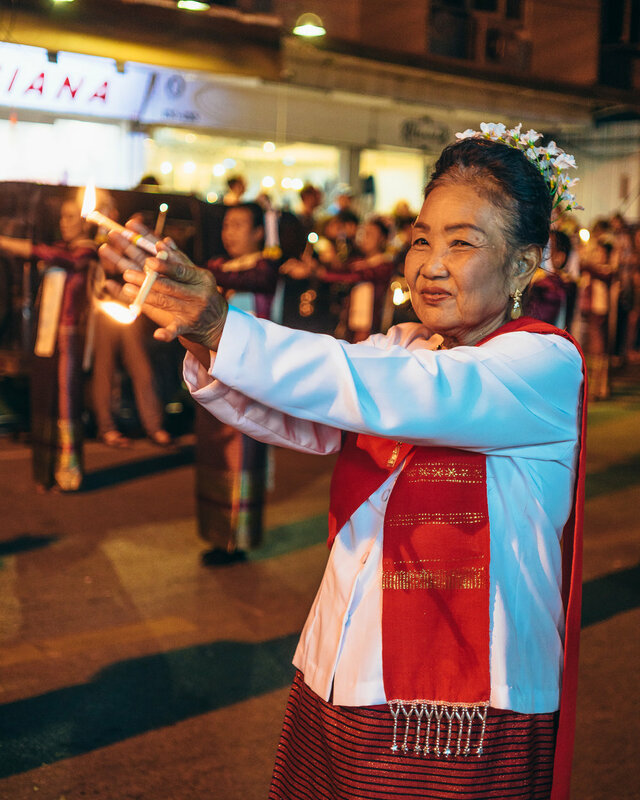 They're celebrated on the evening of the full moon of the 12th month in the traditional Thai lunar calendar. For example, the next Loi Krathong and Yee Peng will begin on November 23rd, 2018. Although there are tickets sold to private events with lantern releases, there is no need to pay anything to enjoy this amazing spectacle. 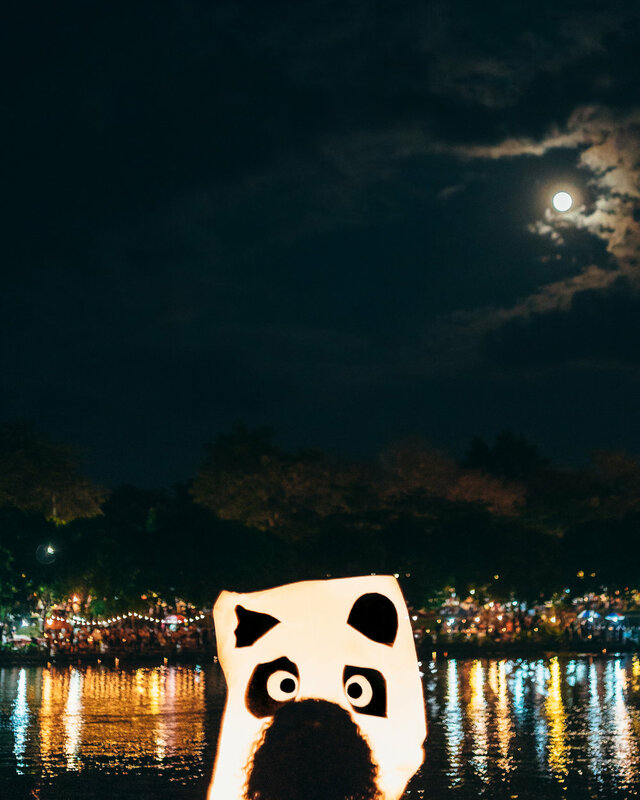 To experience the festival as a Thai would, go to the Nawarat Bridge and the area around the Ping River to watch an enormous launching of lanterns after the sun sets on the day of the full moon. Furthermore, different temples host events with beautiful settings and traditions, with Wat Phan Tao being one of the best (seen below). Here, you can also learn how to make your own Krathong (adorned candle-holding raft) for 100 baht. It is a unique experience worth the cost of admission, but do not believe them when they tell you that you are not going to be able to find Krathongs for less on the street — you’ll find them for as little as 20 baht on the way to the bridge. Did you find anything on our list you’re really looking forward to, or is there something you think you should be on the list? *This article may contain affiliate links; anything that you purchase will help support this site at no additional cost to you. Also, we were guests at some of the above-mentioned activities; nevertheless, opinions found in this article are solely ours and authentic!